Relax Gaming is one of the top online casino games software developers in today's industry. The company is situated in Malta while it operates all over Europe including the UK and other fully regulated online casino markets. Relax Gaming is best known for its innovative poker clients provided to many online casinos, while its instant win games and its online slots also enjoy great popularity among online casino players. The Relax Gaming software features remarkable visuals, very creative features while it also comes equipped with remarkable rewards programs. Since their games are built using the latest HTML5 technology, they are accessible across all modern mobile devices. This relatively new competitor in the industry features an excellent slots library which is enriched by the company’s latest release named King of Kings. As suggested by the game’s title, this Relax Gaming release is actually an ancient Egypt-inspired game. It comes packed with 5 reels and 5 paylines. Following the game’s theme, its reels are set against a mysterious temple and neatly flanked by Horus statues which stand on both sides of the reels. The game’s backdrop also depicts majestic pyramids and golden dunes in the distance. As players hop on this virtual journey, they will come across a myriad of neatly rendered symbols. The game’s symbols include a variety of colorful gems including orange, red, yellow, green and blue gems which act as the game’s lower-valued symbols. The game’s premium symbols include Bastet or the cat goddess, Horus or the Egyptian ruler protector, Anubis or the regeneration symbol while the most valuable symbol is Tutankhamun. Landing five of these symbols on the reels can yield winnings going all the way up to 200x players’ stake. When it comes to the game’s bonus features, players will not be disappointed. 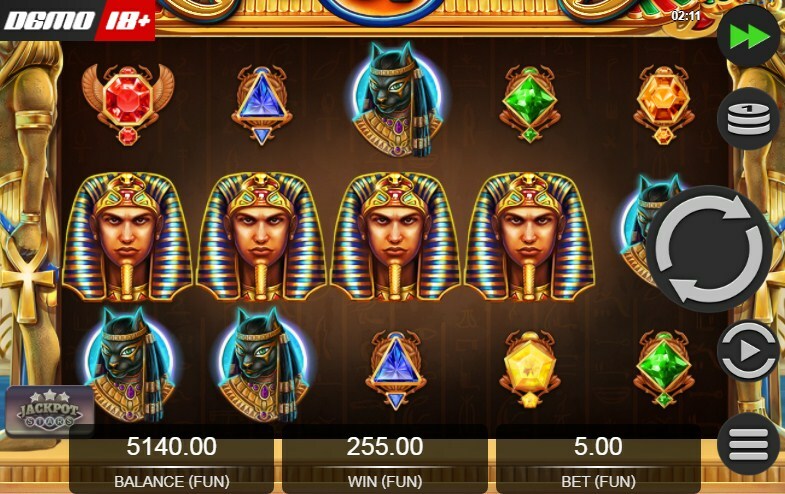 King of Kings slot come packed bonus symbols including its wilds and scatters which are depicted as the golden Ankh. This symbol has its usual power of replacing regular symbols on the reels. Moreover, it can also yield generous winnings going up to 1,000x players’ stake. The main game’s attraction is definitely its Bonus Symbol Re-Spin mode. Once this bonus mode is triggered, players receive one free spin with one randomly chosen symbol which acts as an expanding symbol. During their King of Kings slot gameplay, players can also trigger the game’s free spins mode. The mode starts with 10 free spins while the gaming area expands by introducing one more reel. With six reels included in total, the winning potential goes up to 5,000x players’ stake. King of Kings slot is a high volatility game with an RTP of around 96% and coin sizes between 0.1 up to 50.